Electronic Kit School. - Do you want to protect your device from power surge in electrica and electronic system now? As we know that some time electric and electronic system have sensitive and valuable that can cause power surge. In this article we will give you one electronic circuit that can give protect your device from the power back surge with the main component used is NE555 IC as astabe multivibartor like in Figure 1 below. Circuit like in Figure 1 above show you about the Power Surge Protector Circuit using NE555 IC. This circuit design to protect your valuable and sensitive electric and electronic device this time. To build this circuit you only provide small component like NE555, resistor, capacitor, relay, diode, transistor and switch. The main power supply to supply this circuit is 5VDC. The ciruit design with is centered around (again) the famed NE555 IC as the timer, served as a bi-polar latch switch with its two comparator inputs and biased at 1/2 Vcc through a resistive-potential divider. The bias provided by the resistors are centered within the comparators trip limits when the threshold comparator will trip at 2/3 VCC and the trigger comparator will trip at 1/3 VCC. 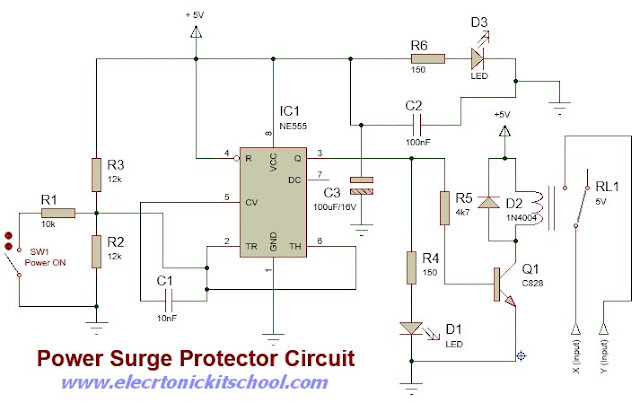 The circuit of power surge protector like in Figure 1 above is simple. The relay remains in the de-energized state when the circuit is powered up or when power supply is resumed. This condition make the power supply prevented from reaching to the connected load. When the push-to-on switch (a good quality momentary push button switch required) is depressed, the circuit turns to active mode, relay is energized, and hence power supply is extended to the connected load. The red LED in the circuit is the “power in” status indicator, and the green LED is the “power out” status indicator. And now you can try to implement this circuit of Voltage Monitoring for +5V Microcontroller Power Supply using LM393 and FDN340P PMOS if needed in your project now.